Apex Magazine issue 83 offers two pieces of original short fiction: “The Laura Ingalls Experience” by Andrew Gray and “The Teratologist’s Brother” by Brandon H. Bell. The poetry selections are by John Yu Branscum, Michael VanCalbergh, Jeremy Paden, and Craig Finlay. Andrea Johnson interviews Andrew Gray about writing “The Laura Ingalls Experience,” as well as its themes, and they also talk about his work as a program coordinator at a Canadian university. Russell Dickerson sits down with cover artist Sarah Zar to discuss art and “Hurricane Woman” her cover on this month’s issue. 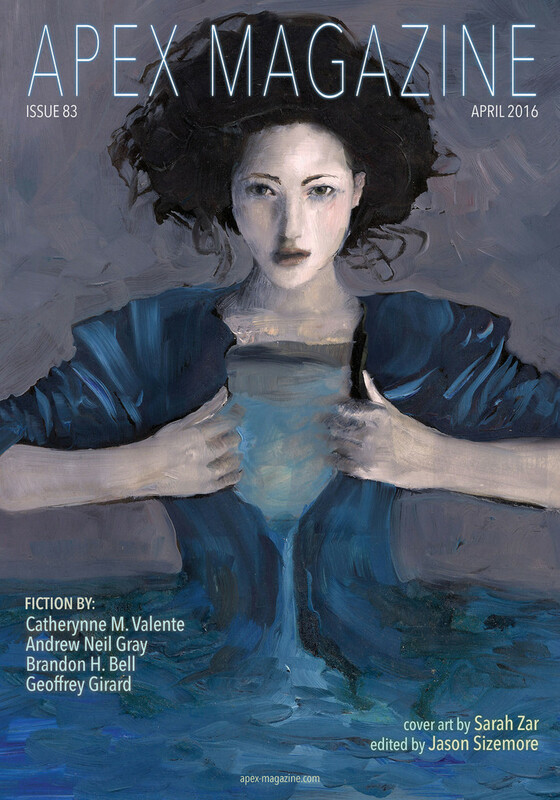 The issue’s two reprints are Catherynne M. Valente’s “The Quidnunx” and “Collecting James” by Geoffrey Girard. The entire issue will be released over the month on the Apex Magazine website, or can be purchased for only $2.99 as a nicely formatted eBook. Subscriptions are also available direct from Apex, Weightless Books, and Amazon. Hi Mike, thank you for sharing! Good to see more ezines breaking out of the short-story box.